Allow me to introduce myself. I have a name that is musical in nature, rather than verbal. I transmit to you via vibration. You might perceive me as feminine in nature and I am, in a sense, one of the many spirits of Joy. If you had to use a name for me, you could call me Ilina (pronounced ee-lee-na) for its vibration suits me well. All of the angels are simply expression of Divine love, so when you call on me – or any of the millions of other angels – you are calling upon the Spirit of Love that lives within us all. The Divine lives within you me, the masters, and every blade of grass, manifest or as yet to be born! You are calling upon the love that exists within universes and ants, within coffee, cream, and sugar, and within your every breath. You are just simply selecting the variety of love you would like to receive today! Mine comes as a feeling of Joy! You can work with me easily. Simply sit quietly and call me. "Ilina, please fill me with the spirit of joy." Breathe and repeat that phrase if you need, and I will come and bring my spirit of joy into your own aura. You might feel a bubbly, or effervescent sensation, a feeling of love expanding within your heart, swirling, or simply a feeling of peace. You might feel as if flowers have been scattered all around you in a beautiful meadow, or as if a puppy has come up to kiss you with unbounded love. Perhaps tears will flow or unexpressed frustrations will be released, thus making way for joy to be experienced in their wake. Don't seek these feelings. Simply call upon me and breathe. Allow me to move the the denser energies stuck within your field. Allow me to facilitate connections within your brain that are more joyous in nature than the conditioned negative responses to life. If you like, you can imagine you are breathing in a bright sunny color – the color of sunflowers, daffodils, or bright morning sunshine! Imagine it filling your heart. Drink that beautiful color into every cell of your body, simply through your imagination and intent. Joy is a spirit – an energy frequency that you can tap into through your desire to do so. I can assist. Joy can be triggered by external circumstances but you need not depend on these. Joy is a frequency that can be found no matter what the outside world is doing. Look at your dear animals. A dog can be happy with three legs, limping or even sick, because the dog has no judgment. The animals accept their conditions, observe them, make adjustments as necessary and continue to focus on the love that surround them – food, hugs, kisses, a warm bed, a cozy pile of leaves, or anything they find pleasant. Can you imagine the joy in the human race if you could simply observe your problems, handle what you can for now, and then go back to enjoying what you can, right here and now? Can you imagine feeling good even while you have bills you don't know how to pay? Can you be delighted with the sunrise and smell of spring flowers even when your body is not perfectly healthy? Can you allow yourself time to enjoy your life even when your loved ones are not... and are too stubborn to let you (or themselves!) do anything about it? Give yourself permission, dear ones, to feel your natural state of being! You were originally programmed to focus on love, joyous desires, and the goodness, beauty, and truth within others! You learned to obsess on the rest. You were programmed to focus on what isn't working – as if that would help you solve the problems. That is unnatural. The soul seeks truth and the truth is that you are loved in every moment of your existence, day and night, 24/7, whether you focus on it, allow it in, or not. The soul focuses on solutions, knowing the focus on desired results draws forth the ideas and assistance to achieve them. The soul is joyous. It loves to create! Voluntarily seek joy. Voluntarily sit with me and allow me to enliven your energy field. Voluntarily turn off depressing news and focus on the good things people are doing in this world. Kiss your puppies. Laugh with your children. Do the things that breathe life into you, and if you don't know what those are, start exploring. Give thanks for the breath that gives you time on this earth and then explore as a child would, to discover your particular brand of joy. Steer your thoughts towards all that is beautiful and wonderful in this world. Life has its challenges, and we do understand. As human beings you will grieve when you lose someone, through death, divorce, or a host of ungraceful ways people leave your life. You will have a momentary survival reaction if you lose a job. You may have a fearful reaction if you discover an illness. You may be depressed if you don't know how to change your unpleasant circumstances. These reactions are deeply conditioned upon your planet earth. There are other realities in which the inhabitants hold a grand celebration when a loved transitions from their existence. They throw a huge party and telepathically connect with the newly graduated soul. They send joyous messages of congratulations, knowing that these newly released souls will now be their guides! Can you imagine, there are realities where every loss of form is met with a zeal to create something new? Can you imagine, even upon your planet earth, there are beings connecting deeply with the joy of surrendering to the unknown – knowing that when they don't know what to do, a higher, more loving force does? Your reality is not the only one, dear friends. It is however the most challenging. So while we deeply understand the unpleasant, depressing, fearful, and often upsetting circumstances on your earth, we know a greater truth. You are loved! Beyond reason! Here and now and always. You never lose a soul. The forms of Divine love in your life change but the Divine never leaves you. We in the heavens want to share this feeling of truth and love with all of you. Sit quietly. Breathe. 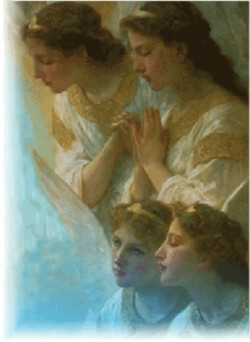 Ask for my help or the help of any angel master, or spirit of love and joy. Allow us to guide you up and out of any darkness, and into the exuberance of your soul which is deeply grateful to live, breathe, and create there upon your earth.